Apple today changed it’s homepage to commemorate the life of former South African President and anti-apartheid leader Nelson Mandela. Mandela died on Friday at the age of 95. In the past, Apple has commemorated the death of individuals such Rosa Parks, Steve Jobs, and Jerry York. Apple used Mandela as an example in its legendary Think Different campaign of 1997. Mandela was depicted as a rebel and leader – the type Apple culture has forever idolized. Mandela fought for his beliefs and changed the world – philosophy deeply ingrained in Apple culture and the late Steve Jobs. 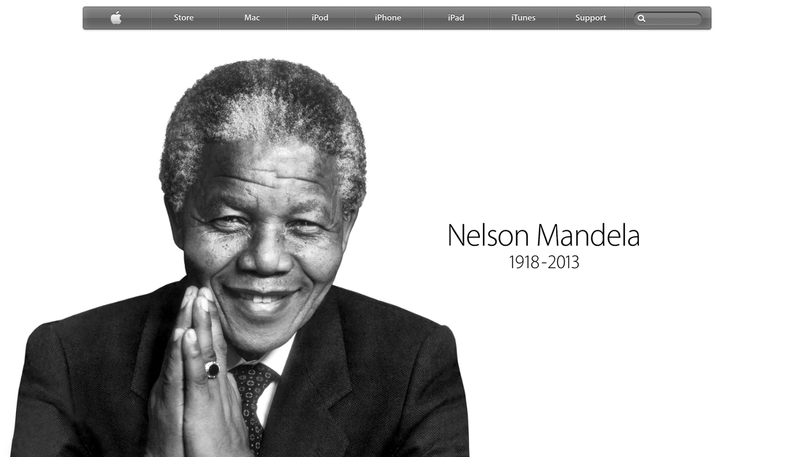 In typical Apple fashion, the homepage only depicts a black and white photo of Mandela and the years of his life. Google, too, honored Mandela by noting his death on it’s homepage (see below). AppleRumors.NET remembers the life of a man who forever changed the world. RIP, Nelson Mandela. This entry was posted in Apple, Breaking, Editorial, Google, iOS, Opinion, Tech Industry. Bookmark the permalink. Pingback: THE GIANT : NELSON MANDELA | EMPOWER NOW !